I’ll try to catch you up on what we’ve been doing. On Friday, we made another trip to Garden of the Gods for more photography. We saw Balancing Rock, Steamboat, Kissing Camels, and a host of unidentifiable formations. We stopped at Culvers on the way home. Those of you from Wisconsin know this restaurant for tasty burgers and exceptional homemade custard. My friends from Mesa will find a branch of this restaurant at Country Club Drive. Try it. You’ll like it. On June 9, Saturday, we drove to the summit of Pike’s Peak. We were at Pike’s Peak from 10:15 a.m. to 1:46 p.m. Two ways exist to explore this 14,115 foot mountain which inspired the song “America the Beautiful.” There is a four-car cog train which goes up to the Summit several times a day. It costs $35 per person and stops at the summit for 35- 40 minutes. It costs $12 a person to drive it or $40 for a maximum of five people. You can get a coupon on the Internet to save $2 off any car rate. The advantage is you can make stops along the way on the 19-mile route. At mile post six, we stopped at Crystal Reservoir. Like the other two stops, you’ll find a café and gift shop. I found here a staff member and his donkey “Honker.” Naturally I could not resist a photo. Outside of the gift shop, we took time to read the signboards about the mountain. At mile post13, we found Glen Cove. It also has a few signboards - but no donkey. We then drove above the tree line to the Summit, stopped number three. Suggestion, on the way to the Summit stay hydrated. I went outside to observe the view. Upon entering the gift shop, I was greeted by a ranger who asked if I was O.K. then immediately escorted me to the EMTs. My oxygen level was down to 74 and my heart rate was more than a hundred. They said I was very pale. I was O.K. after sitting and drinking some water. Earl didn’t get hit by the altitude. So, if you go, DRINK WATER. Before you go to Pike’s Peak, hit the Internet again. You can get coupons for a free delicious fresh doughnut at the Summit. You’ll need one coupon per person. On Sunday, we had lunch at the Broadmoor built in 1918. The hotel is exquisite and is the premier hotel for Colorado Springs. 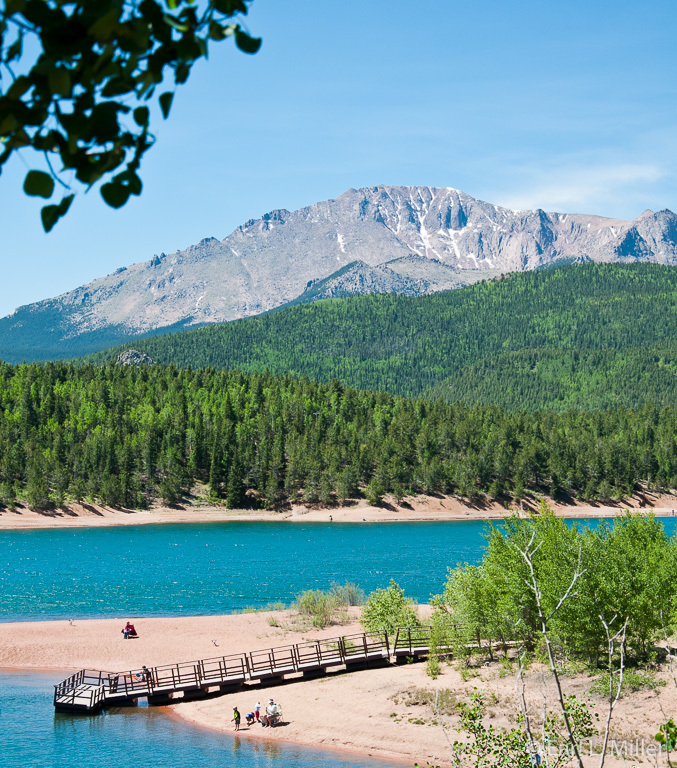 It was constructed by Spencer Penrose who was also responsible for the zoo in Colorado Springs and Pike’s Peak Highway. 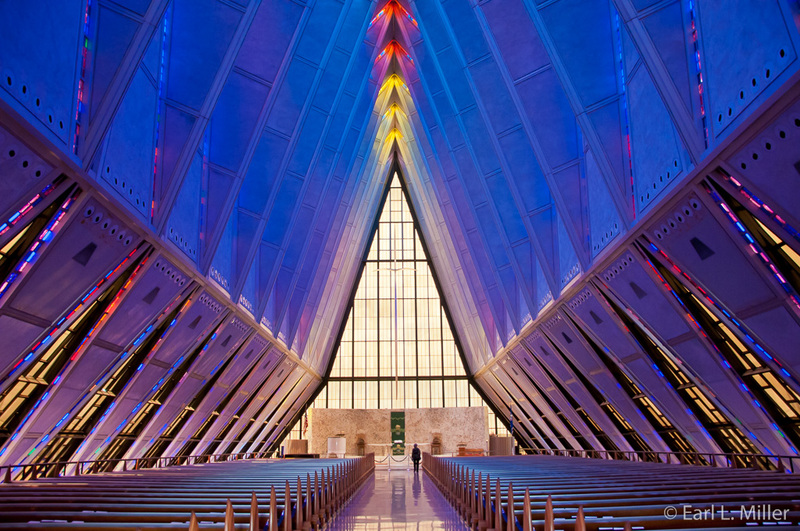 Today, we explored the Barry Goldwater Academy Visitor Center and saw the chapel at the Air Force Academy. We still have more to see of the Academy but ran out of energy and blue skies for photographs. You can watch an eleven-minute film at the Center and check out lots of exhibits about the life of cadets. You’ll learn about the honor code, their character development, the educational offerings, military life, sports, and their choice of recreational organizations. Many don’t realize that Colorado Springs was one of 400 sites for the Academy. The two other final choices were Lake Geneva, Wisconsin and Alton, Illinois. The first class, 306 cadets, was admitted on July 11, 1955 to Lowry Air Force Base. While the Academy was being built, between 1959-1962, a total of 1400 cadets entered the Academy at Lowry. In August 1958, the entire corps walked through the gates of the present site. In 1959, the first class, 207 cadets, became second lieutenants. The main buildings are very modern. A lot of aluminum was used in these structures suggestive of skin on an airplane. The most recognizable is the 17-spire chapel. We learned cadets receive six weeks in basic training when they first reach the Academy. This starts in June. At the end of their training, they receive shoulder boards indicating they are now cadets. In their sophomore year, they complete combat survival and many participate in parachuting. Juniors assume various leadership roles and work on teamwork. Seniors are the leaders of their class wings. They complete preparations to be air force officers. The Academy offers more than 400 courses in science, engineering, humanities, and social sciences. Cadets must take two military courses and ten athletic courses. A choice of 31 majors exists. Faculty teaches at the Academy for three to four years before being assigned other military positions. 52% of admitted cadets are in the top ten of their high school class. 80% have high school athletic letters. 64% are members of the National Honor Society. More than 200 women are in each class. You’ll find a map marked by pins showing the hometowns of cadets at the visitor center. You can eat at the center’s Subway and shop at an extensive gift shop. 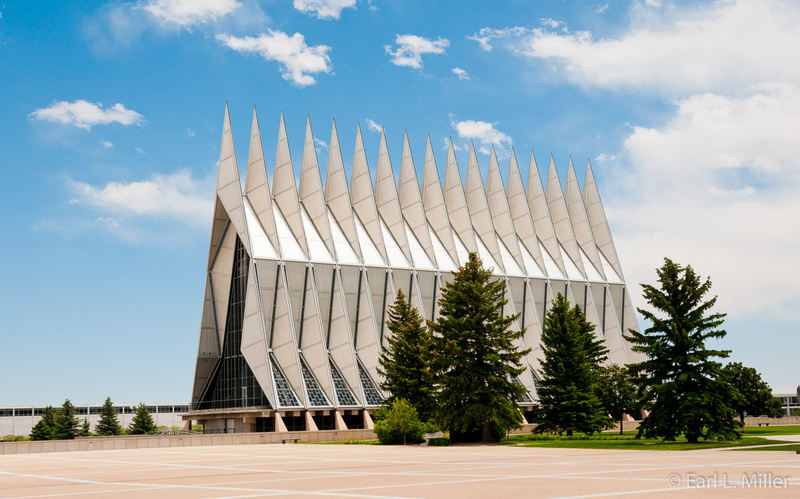 The cadet chapel soars 150 feet. The Protestant Chapel is the largest and has a Moller Company organ with 83 ranks, 67 stops, and 4,334 pipes. The same structure contains chapels for Buddhists, Catholics, and Jews. The surrounding foyer of the Jewish chapel is paved with 1,631 pieces of Jerusalem brownstone donated by the Israeli Defense Forces. The paintings inside the chapel were done by Shlomo Katz, a holocaust survivor. In the foyer in a display case is a Torah discovered in Poland in 1989 in an abandoned warehouse. It was saved from the Nazis during World War II. In the Jewish chapel, you’ll notice individual seats. The Buddhist chapel has mats. The others have pews. Tomorrow we are joining our friends, Bob and Marge Card, for a trip along the scenic byways near Cripple Creek. I’ll write about that the next time.